Facebook is heating up again. My democrat friends are writing words celebrating Paula Deen’s fall from grace. My republican friends are writing words lamenting it. My republican friends want our borders secured. My democrat friends, are celebrating the Senate’s passing of the immigration reform bill. All this back and forth has me thinking about the traditional positions of both my liberal and conservative friends, and how it might affect our door keeping. Door keeping, as in opening or shutting the door of heaven. A nightmare of mine is that on the day of judgment, my day of judgment, in the moments just after I die, I stand before God. And He says the words, You’re guilty, of shutting the door of the kingdom of heaven in people’s faces. Father in heaven, let me never hear those words! I never want to hear those words directed at me. Now washing before eating is a good thing, but it’s just not a priority in God’s way of thinking. God’s priorities are found in God’s word, in the bible. Jesus said to them that their emphasis on washing and their other traditions were hindering people from entering into the kingdom of heaven. Declaring something as Corban was a tradition used to dedicate the thing declared, to God. The problem was that some of the Pharisees of Jesus’ day took this to such an extreme that the dedicated thing was off limits to use in any other fashion, even if it meant violating God’s commandment to honor one’s father or mother. So they were so wrapped up in their traditions that when an elderly parent was in need of something, the Pharisees and lawyers wouldn’t permit a person to help their own mom or dad. 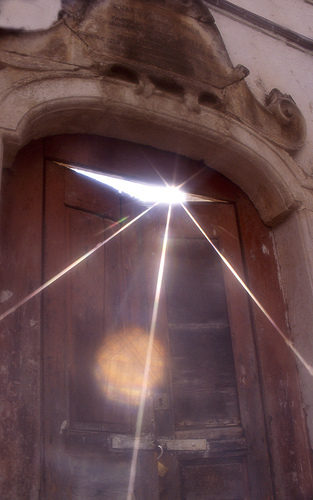 Do you realize you control the door to the kingdom of heaven? Whether or not that door is opened wide, or slammed in someone’s face, depends on you. Like the Pharisees, our own traditions can shut the door of the kingdom of heaven on people. But Jesus loved people by opening up that door. So don’t get hung up on your own traditions. If you’re a republican who buys American, don’t let the fact someone owns a Toyota Camry distract you, from opening up God’s kingdom to that person. If you’re a democrat who traditionally leaves a small carbon footprint, open the door wide to that guy who drives a Dodge Ram Mega Cab pickup. Perhaps the most common way in which we shut the door of God’s kingdom on people occurs when we fail to love like Jesus. When the tradition of our fleshly humanity wins out over God’s Spirit in our lives, we repel people away from the kingdom of heaven, we shut the door. Of course that’s what this series is all about, opening the door of heaven to people by loving them like Jesus. Our traditions. We can be very passionate about them. Flesh vs. Spirit, Republican vs. Democrat, Maddow vs. Limbaugh, or perhaps the two most contentious opposing traditions of all, Android vs. iPhone. Our traditions can shut up heaven from people. “You have a fine way of setting aside the commands of God in order to observe your own traditions!” Jesus said. Let those words never be spoken to you or to me. Whatever your traditions, even if they’re good traditions, don’t let them shut the door to heaven on someone. You be someone who opens up God’s kingdom to people. This entry was posted in Bible Commentary, Bible Study, How Jesus Loved People - How You Can Too and tagged Christian democrat, Christian politics, Christian witness, kingdom of heaven, liberal vs. conservative, Love like Jesus, republican vs. democrat by Kurt Bennett. Bookmark the permalink. This blog post really resonated with me Kurt because as you know, I have a heart for evangelism. I love how your theme of your blog post was that we have to be intentional about sharing the Kingdom of heaven with others. I loved it when you wrote, “A nightmare of mine is that on the day of judgment, my day of judgment, in the moments just after I die, I stand before God. And He says the words, You’re guilty, of shutting the door of the kingdom of heaven in people’s faces.” I have a similar nightmare. What if I go to heaven and I don’t see the people that I want to see? What if they are in the lake of fire forever and ever being tormented where there is wailing and gnashing of teeth? For me, thinking about hell gives me compassion to share the gospel with the lost. Thanks for a wonderful blog post, as usual, I’m going to share it on Twitter. Well said, Kurt. I am again reminded that Jesus did not come to close doors to forgiveness, but open them wide for anyone willing to change their life. This is a worthy post my friend. I truly enjoyed reading it. Loving like Jesus is a difficult task, but that should be one of our priorities. I’m like you Noel. I also have strong traditions, and strong opinions. But as Jesus said, loving God, and loving others, so the door to God’s kingdom can be opened, that trumps my traditions and opinions. And as you said, it can be difficult, but that’s the priority. Thanks for stopping by. God’s richest blessings on you.